Warner &amp; Swasey WSC-6 mdl. M-5600 CNC Turning center s/n 3281613 w/ Fanuc 0-T Controls, 10-Station Turret, Hydraulic Tailstock, Parts Catcher, 7” 3-Jaw Power Chuck, Chip Conveyor, Coolant. American Pacemaker 14”x 54” Lathe w/ Taper Attachment, 23-2500 RPM, Inch Threading, Tailstock, 12”4-Jaw Chuck, 8” 6-Jaw Chuck, 5C Collet Nose, Coolant. Ramco 14” x 40” Lathe w/ 35-1330 RPM, Inch Threading, Tailstock, Tool Post, 8” 3-Jaw Chuck Hardinge mdl. HC Hand Chucker s/n HC-1207- D w/ Threading Attachment, 125-3000 RPM, Power Feeds,5C Spindle. Hardinge mdl. DSM-59 Second OP Lathe w/ 6-Station Turret, Cross-Slide, Tool Post. Brown &amp; Sharpe No. 2 Automatic Screw Machine s/n 542-2- 5201-14 w/ 6-Station Turret, 3-Cross Slides. Import mdl. 110-0820 8” x 20” Lathe s/n 0677 w/ 130-2000 RPM, Inch/mm Threading, Tailstock, Tool Post, 110 Volt. Bridgeport Series 1 – 2Hp Vertical Mill s/n 236776 w/ Anilam Miniwizard DRO, 60-4200 Dial RPM,Chrome Ways, Power Feed, 9” x 42” Table. Bridgeport Series 1 – 2Hp Vertical Mill s/n 236656 w/ Anilam Miniwizard DRO, 60-4200 Dial RPM,Chrome Ways, Power Feed, 9” x 42” Table. Central Machinery mdl. ZAY7032G Mill/Drill Machine w/ 95-1500 RPM, 9 ½” x 27 ½” Table. Edwards mdl. 3-25/2000D 79” x 1/8” Power Shear s/n 74C/38001 w/ 41” Squaring Arm, Front Material Supports. Chicago mdl. 68-B 36-55 Ton x 8’ Press Brake s/n L-17485 w/ Controlled Back Gaging, 8”Throat, 77 ½”Between Uprights. Minster No. 7 75 Ton OBI Stamping Press s/n 17167 w/ 22” x 34 ½” Bolster. Minster No. 15 OBI Stamping Press w/ Triad Controls and Brake Monitoring System, Light Curtain, 18” x25” Bolster. David Ross No. 0 OBI Stamping Press w/ 7” x 10 ½” Bolster. American Machine &amp; Hydraulics “Blue Boy” Hydraulic Tube Bender w/ AMH Controls. Haeger mdl. HP6-C 6 Ton x 18” Hardware Insertion Press s/n 2062 w/ Haeger Bowl Feeder. Timesavers mdl. 325-1 25” Belt Grainer s/n 7947. Clair Mfg mdl. 603 20” Belt Grainer s/n 3165. Custom 18” Power Roll w/ 2” Rolls, Stand. Miller 330A/BP AC/DC Gas Tungsten Ark Welding Power Source w/Cart. Matco mdl. WFW160 160 Amp MIG Wire Welder. Peer mdl. 103 30kVA x 16” Spot Welder. Miller SSW-2020ATT 20kVA x 20” Spot Welder s/n KK204940. Miller MPS-10FT 10kVA Portable Spot Welder w/ 9” Throat. Import 10kVA x 16” Spot Welder. 4’ x 8’ Welding Table. Boyar Schultz mdl. H-618 “Husk-E- Line” 6” x 18” Surface Grinder w/ 6” x 12” Fine-Line Electromagnetic Chuck. Thompson 6” x 18” Surface Grinder s/n D57137 w/ LBP Electromagnetic Chuck. Hammond Pedestal Carbide Tool Grinder. Baldor and Craftsman Pedestal Grinders. Burr-Chief mdl. 482 2” Belt Sander w/ Stand. Kalamazoo 6” Belt / 12” Disc Sander. 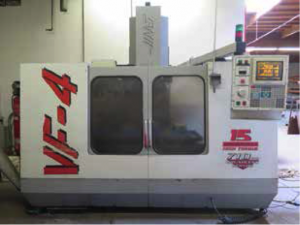 1997 Haas VF-4 4-Axis CNC Vertical Machining Center s/n 4994 w/ Haas Controls, 20-Station ATC, CAT-40 Taper Spindle, 7500 RPM (NEW SPINDLE), Brushless Servos, Programmable Coolant Spigot, Quick Code, HiVolt Transformer, Rigid Tapping, Chip Auger, 18” x 52”Table, Coolant. 1997 Haas VF-1 4-Acis CNC Vertical Machining Center s/n 9343 w/ Haas Controls, 20-Station ATC, BT-40 Taper Spindle, 7500 RPM, Brushless Servos, Programmable Coolant Spigot, Quick Code, Rigid Tapping, Chip Auger, 14” x 26” Table, Coolant. 1992 Haas VF-1 4-Axis CNC Vertical Machining Center s/n 1465 w/ Haas Controls, 16-Station ATC, CAT-40 Taper Spindle, 7500 RPM, 14” x 26” Table, Coolant. Kitamura MyCenter-0 CNC Vertical Machining Center s/n 00142 w/ Fanuc System 10M Controls, 16-Station ATC, BT-30 Taper Spindle, 300-7200 RPM, Travels X=12”, Y=10”, Z=10”, 10” x 20” Table, Coolant, (NEW BALL SCREWS ALL AXES). Powermatic mdl. 87 20” Vertical Band Saw s/n 487301. Import mdl. RF712N 7” Horizontal Band Saw. Kalamazoo mdl. KI-7 7” Horizontal Band Saw. (2) Clausing 20” Variable Speed Drill Heads. Dunlap Table Model Drill Press. Howard Strasbaugh mdl. 68K 5” Lapping Machine s/n 557-9- 83. LOH mdl. ALC Pass-Thru Wash Line w/ 3 ¼” x 7” Cap. Vitap Pin Router w/ 27” Throat, 32” x 39” Table. Media Tumbler w/ 16” x 32” Tub. Amcot mdl. STH-8 Cooling Tower. US General 7.5Hp Vertical Air Compressor w/ 80 Gallon Tank. Husky 7Hp Vertical Air Compressor. Topcon mdl. PP-30E 12” Bench Model Optical Comparator w/ Surface and Profile Illumination. (2) Kodak 14” Optical Comparators (NEEDS REPAIRS). Standridge 36” x 48” x 6” 4-Ledge Granite Surface Plate w/ Stand. Mojave 24” x 36” x 6” 2-Ledge Granite Surface Plate w/ Stand.